Image is broken, try again. My buddy manage to get something working while a Russian helped me obtain Renge from a converted Arnval model that I can now mess about with Renge. I have two sources to play around with now that it's awesome. I'm also amused by the Arnval sword you have going on Halcon. I guess we're going to be the only two keeping this alive trying to stir the pot to see if anybody reacts. I may end up being accidentally obnoxious again. If there's a will, there's a way. I'm happy I was stubborn enough to commission someone to get not just 1, not 2, about about 5 Shinki Renge variations. One being basic, one being A'K version, Hoppu sized A'K Renge, Full combat gear, Scathach with Renge on her head; Trying to build a world to contain a Shinki Renge shrine. One thing I still fear is that people are still going to hate me to those that found me vile back in January 2017 that I won't be able to be on a positive note with them. Depression is no laughing matter that I had no outlet, thus why I snapped. But yeah, depression aside I'm thankful I managed to keep pushing to get Shinki Renge in a game to see I wasn't the only one trying. Don't try for 1:1 human scale, try for Shinki scale. I'll be saving these models so I can then use them in 'Rising World'... Still waiting, yes... They will be used when the time is right. Well, I appreciate the constant plugging away, anyways. I'm back on my blog trying to get back into the swing of things. Now, with you being able to mount & fly around as avatars I'm now wanting to look into getting the Vic Vipers into the mix. Need to save up first, then I can look into getting Vic Vipers into VRchat to both mount & fly. 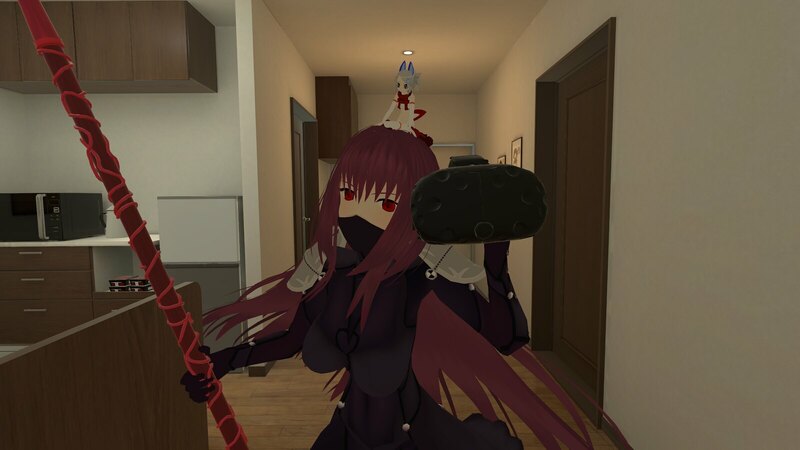 I'm eventually going to make a world where you should be able to gain public versions of the Busou Shinki avatars so we'll see where that leads. Basic Renge should be first whenever that is tackled.